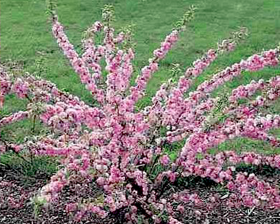 Early in the spring before other shrubs have budded, the Flowering Almond is covered with double pink, rose-like blossoms. It grows at a moderate rate, reaching up to 1,5m tall. It develops multiple, thin branches with spring blooming. 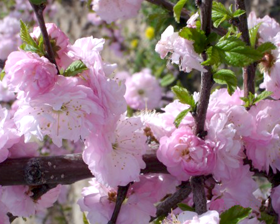 The Prunus glandulosa a cultivar has double, pink flowers 2-3cm in diameter. It works well as a specimen, in borders or at the edge of woods or other natural areas. Seeds require 2 - 3 months cold stratification. Sow seed in a cold frame as early in the year as possible. Protect the seed from mice etc. The seed can be rather slow, sometimes taking several months to germinate. Prick out the seedlings into individual pots when they are large enough to handle. Grow them on in a greenhouse or cold frame for their first winter and plant them out in late spring or early summer of the following year.